Climate Central‘s peer-reviewed projections should business resume “as usual”, published in the Proceedings of the National Academy of Sciences of the U.S.A. In summation, Lower Manhattan may want to start garnering gondolas and building floating docks, or it may just be time to head for the Colorado Rockies, build an ark, and wait for Waterworld to begin. 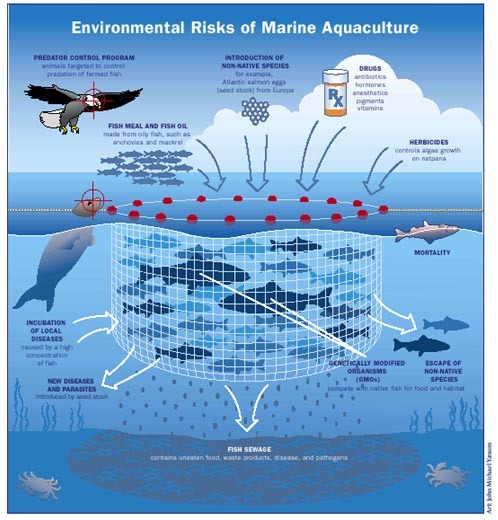 Illustration of Bren Smith’s 3-D ocean farm. Image from GreenWave.org. There is a revolving door in global markets for food fads. Coconut water and related products have become a billion-dollar industry. Kale, in the ‘chip’ form alone, made about two hundred million dollars last year. But there is a new contender that is gaining in popularity, sneaking up on a number of different food products and may turn out to be far more than just a fad – seaweed. I’ve always been fascinated with seaweed, especially since my husband is an ecologist who studies algae, and I’ve worked with him on several studies, as well as in the aquaculture world. So last week’s article by Dana Goodyear in The New Yorker was especially interesting. The article laid out the future of seaweed on the American plate – “A New Leaf: Seaweed Could be a Miracle Food—If We Can Figure Out How to Make it Taste Good”. In the article, Goodyear explores all the potential roads to success for the ‘sea vegetable’, especially against the backdrop of seaweed as a carbon negative crop; as a conservation measure to restore seaweed habitat and the thousands of marine species that rely on it, and as a way to mitigate impacts of run-off due to the fantastic ability of seaweed to absorb nitrogen and phosphorus. Goodyear features Bren Smith – a fisherman turned entrepreneurial ocean farmer, who wants to bring sustainable seaweed and shellfish to a table near you. Smith is a lifelong commercial fisherman, who turned to aquaculture as a way to restore jobs for out of work fishermen, and help hedge against climate change, while creating an environmentally-friendly farm that has zero inputs. Kelp harvest. Image from at Thimble Island Ocean Farm. For an in-depth, 2014 Scuttlefish interview with Smith check out: Life in Salt: A Talk with Bren Smith, Owner of Thimble Island Oysters and Long Island Sound’s First Vertical 3D Ocean Farm. Screenshot from the BBC’s video clip taken from Lesbos. An estimated three-quarters of a million migrants have made the shores of Europe this year alone, mostly in the Greek Islands bordering Turkey. As a result, “tens of thousands” of lifejackets, the BBC reports lie along the shores of islands including Lesbos, where fishermen now say the waters are so clogged that they can’t even manage to fish. Unfortunately, these mountains of nylon, plastic and foam are presenting a far greater, long-term dilemma. Some are calling them an “ecological timebomb”, but, according to the BBC, authorities say they don’t have the capacity to “dispose” of the safety vests. There’s been a lot of talk about the recent footage of a white shark tearing apart a seal off Alcatraz, but did you know that there are about seven species of sharks that regularly visit San Francisco Bay, all of whom serve critical roles in the ecosystem? Close out Sharktober with the Aquarium of the Bay on October 29th for an evening short films, photography and lectures on San Francisco Bay’s sharks by David McGuire (Shark Stewards) and Michael Grassmann (Aquarium of the Bay).